Comics are great because of the amount of variety we have as fans. There’s something for everyone. No matter what you like, there’s a comic, be it from a big company or independent publisher, for you. If you happen to find something you like, that’s great. Support it, read it, and tell all other comic book fans about it. That’s the whole point of me doing my comic book reviews. The thing that gets me the most traffic on this site are my reviews of superhero blockbusters like Logan, or my pieces on diversity in comics. My comic reviews usually don’t garner too much attention, but that’s not why I write them. A while ago, I reviewed the first couple issues of Batman Rebirth, Black Panther, and the entire Nighthawk series. These comics were special to me the past year. I didn’t review everything I liked in the past year, but I try to get as much content as I can on this page. The Fall and Rise of Captain Atom needed to be reviewed because of how important this character is to me. There’s been a lot of talk recently about comic book companies roles in promoting diverse characters to customers. I don’t work at Marvel or DC so anything I tell them doesn’t matter too much, in regards to promotion. I like to focus on my role, as a customer and a fan of comic books. Yes, we can buy it, but there’s other things we can do as well. As a writer, the easy thing I can do for comics I like is review them. Captain Atom as a hero is tragic, but also selfless. His world is littered with complex science, some of it made up. Those two things make me love the character. Since he isn’t their most popular character, people need to know about him. I felt the same way about Nighthawk. Certain people who may not like the gritty nature of a hero like Batman, or the sheer nonsense of some Superman stories might gravitate towards a hero like Captain Atom. But if they don’t know about him, then all of this doesn’t matter, does it? My point in saying this small PSA is that if you love a comic, make sure you get out there and tell people about it. 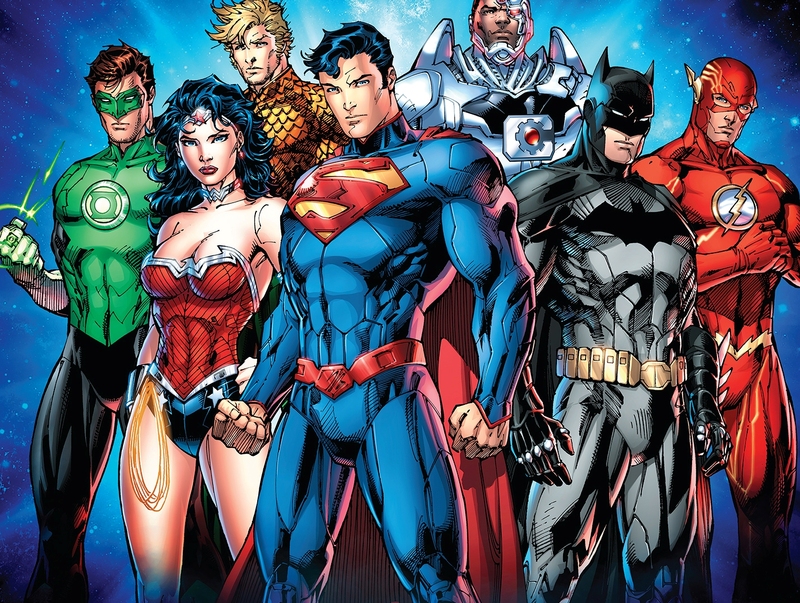 Annoy everyone you know who’s even somewhat interested in superheroes. Pitch it to them like it’s a multimillion dollar business deal. That’s how I do it anyway. When people can feel the passion I have about a character or story, and they’re interested in comics or superheroes, they usually check it out because of my recommendation. We all do this, we can continue to help unknown characters grow. Today, I’m reviewing The Fall and Rise of Captain Atom issue number 3. Time to recap a bit. The first part of this story is the end of an era for Nathaniel Adam aka Captain Atom. This story started with him getting “sick” in the first issue. His quantum based powers started to flare up. His body was releasing energy that was harmful to everyone around him. The public doesn’t trust him. The reaction he garners is similar to Superman in the DCEU. They see him as a ticking bomb. The Justice League, even with all of their understanding of superhumans, distrust him too. In the first issue, Captain Atom saved a cruise ship from sinking over the ocean when a flare up started. Superman, Green Lantern, and Cyborg soon appeared and tried to help but they failed. His powers got out of control and destroyed part of a town. Stricken with grief, Captain Atom attempted to kill himself. Problem is, the quantum surge sent him back in time in his human form. The entire second issue saw him living a normal life in the late 90’s. The time stream corrected itself though. His powers manifested themselves again and he was transported back to the future. Writer Cary Bates and Artist Will Conrad have done a great job on this story so far. We saw Captain Atom FINALLY achieve a sense of happiness, but now, once again, he must face life head on, with nothing. His powers have come back and the wife he left behind, never got a chance to hear the truth. This issue is back to the drama with the military trying to control Nathaniel. He’s not a pawn however. I love this issue because of the consistency, but mainly, the ending. On the cover of this issue, DC doesn’t try to give us false hope. We see Atom at the feet of a grave, sobbing. The grave is his wife, Takara Sato. She died in 2010. He has been transported back to the year 2017, so right off the bat, you know she’s not alive. That was unfortunate because something should’ve been done with their relationship. Would Takara still love him? Did she have the baby she didn’t tell him about? Killing her seems like a bit of a copout, but given the ending of this issue, I don’t mind it too much. So, Captain Atom is back in the future, but he looks completely different. No bright blue skin with a red symbol in the middle. He’s now rocking a reddish-brown skin color with a red glow around his body. I’m not a huge fan of this look, but I’m sure it will eventually grow on me. Maybe not. This is huge because people don’t recognize him. He lands in a construction yard and the workers don’t know who he is. 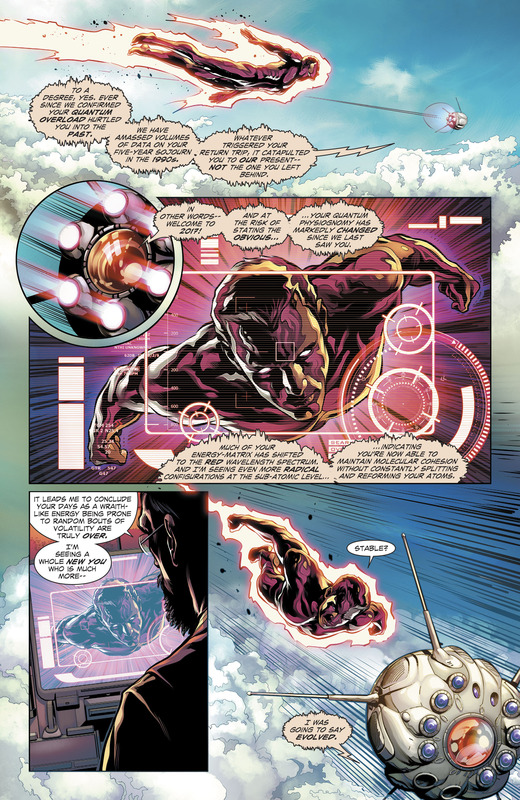 Things get interesting when Dr. Megala, the scientist responsible for the accident that made him Captain Atom, immediately begins to speak to him via a nano-com array that was installed in him a while ago. Captain Atom makes a point by stating it sounds like Megala’s been expecting him. That’s because he has. Megala and the other scientists were able to detect his energy in the past for the last five years. When he was hurdled into the future, that same energy signature popped up immediately. Megala then also tells Nathaniel his powers have evolved. His body is able to maintain its quantum structure without splitting and reforming his atoms. He tells Nathaniel that his days as a volatile being are over. That’s refreshing because there’s only so much you can do with the stability of his powers. I love that he’s “evolved” as Megala said. It allows for the character to go in a new direction. Huge positive for me with this story. This story is interesting on another level because of the amount of input the government tries to have in Nathaniel’s life. When he arrives to Megala’s new facility, since the Continuum was officially shutdown, he learns that they were able to monitor him because of the nano-com in his brain. It was still giving off faint signals that they were able to track. Also, he learns that they knew about his wife, Takara. They even know her occupation and the date they got married. He asks Megala where Takara is, and instantly, he’s shut down. Megala tries to dissuade him from trying to find his wife. Once again, this is why I love this character. He doesn’t take no for an answer. His red energy lights up around him and he tells Megala his only concern is finding his wife. The next scene shows Captain Atom at the grave of his wife. Megala is still talking to him. He tells Atom they looked into it. Apparently, she died in a car crash. No signs of foul play. Call me crazy, but for some reason, I feel like Megala lied to Nathaniel here. Only time will tell. Artist Will Conrad does great work here by showing the pain on our hero’s face. He says that Takara never got to know who he really was. That she must think he ran out on her when she needed him most. An unforgivable act and he hates himself for it. He attempts to leave the planet. The drone Megala is using to speak to him follows him. Captain Atom doesn’t want to hear it anymore and destroys the drone. His new powers haven’t fully been tested yet, so he is unable to survive out in space. Atom falls from space back to Earth, where an eager General Eiling has a team pick him up. 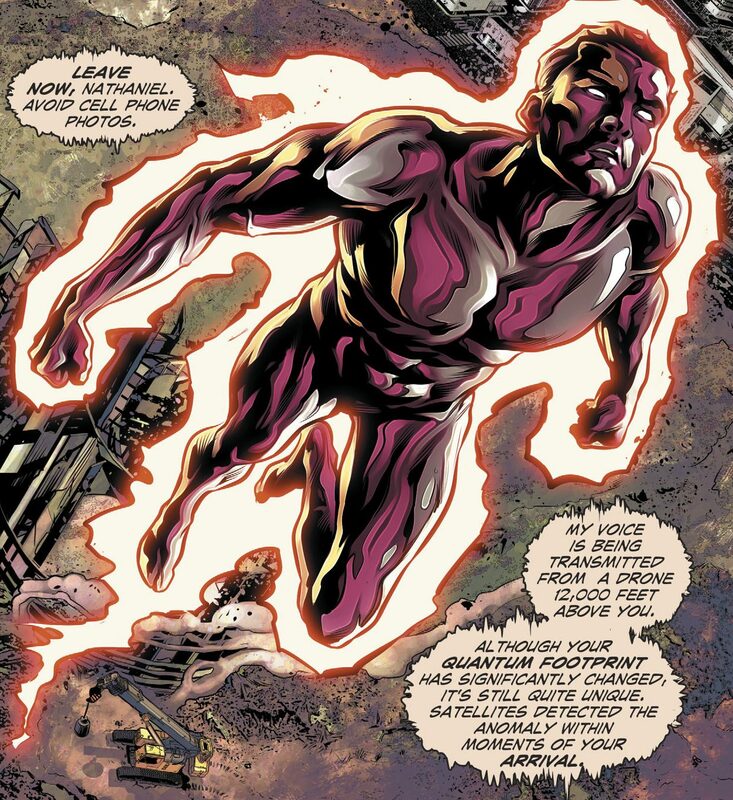 Eiling is the military figure in this story who wants to use Captain Atom as a weapon. This issue ends with a human Nathaniel Adam sitting in his government-issued apartment. He’s looking up information about Takara. He tells himself that if she was alive, he’d do anything to be with her, even be a government pawn. Just as that thought is circulating through his head, a package is delivered to him. An iPad with a picture of a boy shows up. The text below the image says that the boy in the photo is in fact Nathaniel Adam’s son. It also says that Eiling and Megala don’t want him to know the truth. It’s simply signed “A friend,” and the issue is over. One sign of a good story is the question aspect. If you keep the reader guessing and they have too many things to think about, almost everything is a surprise. Game of Thrones is a masterclass in keeping readers anticipated. This story has shifted the tone of Captain Atom comics, and while I was skeptical about the direction while reading this issue, I love the innovation in getting here. Having Nathaniel Adam travel back in time, acquire new powers, and get a new appearance is a great way to transition into a new story for the character. Now that he doesn’t have to worry about people hating him or blowing up the world, Nathaniel’s concern is trying to find an identity. It’s been a theme present in Captain Atom comics before, but now it’s at the forefront. As he told General Eiling, he’s a free man. Only in thought though. This story has a lot of people involved in every aspect of Captain Atom’s life. The reveal of his son at the end of this issue shows that even his “friend” Megala is keeping stuff from him. Now, he must make a choice on where to go with his life. It’s a choice I envy because he can literally start over if he wanted. At the same time, the invasion of privacy is something I couldn’t deal with. People either see him as a deceased menace or a new opportunity for their own agenda. He’s a person with dreams and fears. All he wants is a normal life where he can raise a family. Unfortunately, that life has been taken away from him, so now his new purpose is finding his son. Bringing the son in almost serves as a surrogate Takara in this story. The same questions arise about the son that would’ve popped up if Takara was alive. Will the son accept his secret? Will the son forgive him for abandoning his mother? Those questions however can’t even be thought of until Atom breaks the hold the government has over him. Halfway done and this third issue has done a wonderful job of transitioning the story. Now, in the next three issues, I have a feeling something big is on the horizon. What it is, I don’t know, but I will be the first one to buy it. The writing is solid, the art is full of life, and the significance to the Captain Atom mythos can’t be understated. Can’t wait to see how it concludes. I’ll say what I say at the end of all of these reviews. Go buy this comic!! If you’ve read three issue reviews at this point, you might not be buying this series any time soon. That’s fine. In the first paragraph of this review I talked about supporting characters you love. This, reviewing, is something any writer should do if they love and want to support a character. Just bringing awareness to you, the readers is all that matters to me. If you enjoyed the review, let me know and remember I’m on Twitter @Hero_Review please follow me for more updates on future reviews and my thoughts on superhero/comic book culture. Next, I review the most recent issue in this story. Until then, Peace, Love, and Comics!